ProDENT 3.8 Megapixel CMOS USB Dental Intraoral Camera , easy to maneuver and simple to operate. Features 6 state-of-the-art LED lamps. High quality optically coated auto focus lens with 70 degree angle viewing. See our feedback, dentists are extremely happy with its image quality! Quick connect/disconnect connector makes connecting through USB 2.0 easy. Freeze button and light on/off button. Handpiece holder has auto-off feature. Imaging software included and XP/Vista/Windows 7 compatible with save/enlarge capability. Picture: 3800000 COMS, Length: 8", Weight: 34g, Focal Length 5-50mm, NTSC/PAL Operation. 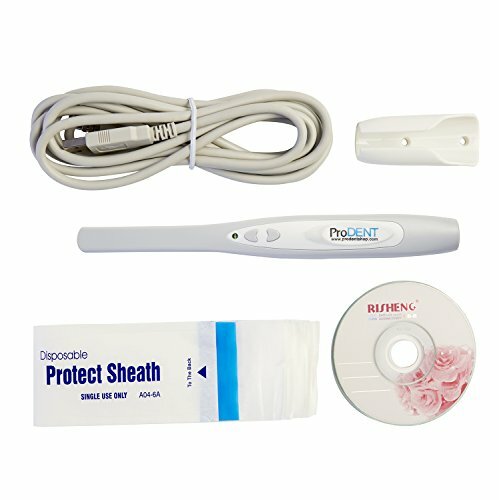 Package includes: Intraoral Camera, PC imaging software CD, 50 disposable clear plastic covers and 10' Quick-Disconnect (3m) USB 2.0 Cable. Best seller for USB Dental Intraoral Camera in United States. Quick connect/disconnect connector makes Intraoral Camera connecting via USB 2.0 easy! If you have any questions about this product by ProDENT, contact us by completing and submitting the form below. If you are looking for a specif part number, please include it with your message.